Zip through the treetops of the Western Cape’s unique indigenous forests and have the chance to get acquainted with local birds and other wildlife in the lush canopies they inhabit! If you love the outdoors and are looking for an active adventure, this may be just the experience to suit you! We offer zipline tours in Cape Town, Hermanus and Caledon to maximise convenience and minimise travel time between other activities on your itinerary. All tours are guided by experienced professionals, so that you can relax and enjoy the ride knowing you are in good, safe hands. CAPE TOWN: This is one of the African continent’s fastest, longest and loftiest zipline adventures, reaching heights of up to 155 metres! 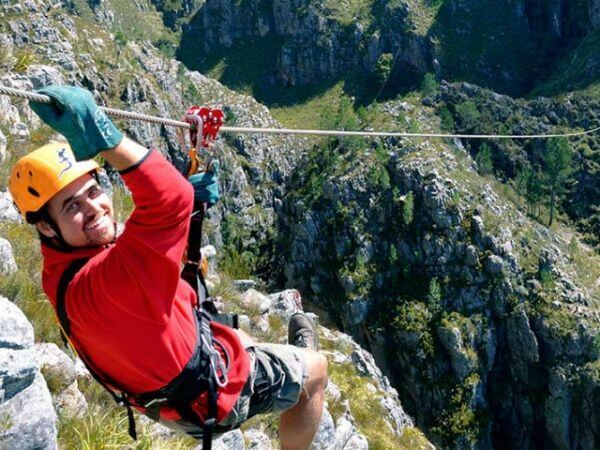 HERMANUS: Swing from platform to platform along ziplines that offer spectacular views of the forest and provide the opportunity to get up close and personal with the resident wildlife. Two different zipline tours are available to cater for different age groups, as well as those who are looking for a greater or lesser adrenalin rush! CALEDON: Experience the sights and sounds of the lush Caledon forest – the whispering rustle of leaves, the calls of birds, the bubbling of streams and the beauty of these ancient woodlands and the creatures that inhabit them.